Having performed with every major orchestra and at venerable concert halls around the globe, Itzhak Perlman was awarded a Presidential Medal of Freedom in November 2015 by President Obama for his meritorious contributions to cultural endeavors of the United States and for being a powerful advocate for people of disabilities. In 2003, he was granted a Kennedy Center Honor by the John F. Kennedy Center for the Performing Arts in celebration of his distinguished achievements and contributions to the cultural and educational life of the United States. He has performed multiple times at the White House, most recently in 2012 at the invitation of President Barack Obama and Mrs. Obama, for Israeli President and Presidential Medal of Freedom honoree Shimon Peres; and at a State Dinner in 2007, hosted by President George W. Bush and Mrs. Bush, for Her Majesty The Queen and His Royal Highness The Duke of Edinburgh. In 2009, Mr. Perlman was honored to take part in the Inauguration of President Obama, premiering a piece written for the occasion by John Williams alongside cellist Yo-Yo Ma, clarinetist Anthony McGill and pianist Gabriela Montero, for an audience of nearly 40 million television viewers in the United States and millions more throughout the world. Born in Israel in 1945, Mr. Perlman completed his initial training at the Academy of Music in Tel Aviv. An early recipient of an America-Israel Cultural Foundation scholarship, he came to New York and soon was propelled to national recognition with an appearance on the Ed Sullivan Show in 1958. Following his studies at the Juilliard School with Ivan Galamian and Dorothy DeLay, he won the prestigious Leventritt Competition in 1964, which led to a burgeoning worldwide career. Since then, Itzhak Perlman has established himself as a cultural icon and household name in classical music. Mr. Perlman has further delighted audiences through his frequent appearances on the conductor’s podium. He has performed as conductor with the New York Philharmonic, Chicago Symphony, Philadelphia Orchestra, Boston Symphony, National Symphony, San Francisco Symphony, Los Angeles Philharmonic and the symphony orchestras of Dallas, Houston, Pittsburgh, Seattle, Montreal and Toronto, as well as at the Ravinia and Tanglewood festivals. He was Music Advisor of the St. Louis Symphony from 2002 to 2004 where he made regular conducting appearances, and he was Principal Guest Conductor of the Detroit Symphony from 2001 to 2005. Internationally, Mr. Perlman has conducted the Berlin Philharmonic, Royal Concertgebouw Orchestra, London Philharmonic, English Chamber Orchestra and the Israel Philharmonic. 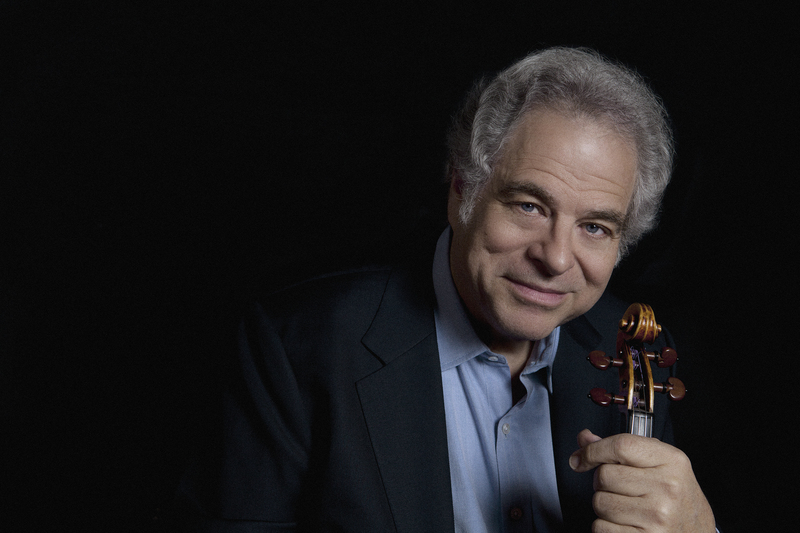 The 2015–16 season commemorates Itzhak Perlman’s 70th birthday with three album releases and worldwide concert tours. For the first time in many years, Mr. Perlman tours with pianist and longtime friend Emanuel Ax in special duo recitals that take them to eight cities across America including Los Angeles (Disney Hall), San Francisco (Davies Symphony Hall), Chicago (Ravinia) and Washington D.C. (Kennedy Center). In December 2015, he performs at Carnegie Hall in a rare trio collaboration with pianist Evgeny Kissin and cellist Mischa Maisky, marking the first time he and Mr. Kissin have performed together. In March 2016, he celebrates the 20th anniversary of his popular klezmer program, In the Fiddler’s House, in comeback concerts with klezmer greats Andy Statman, Hankus Netsky and special guests from the Klezmer Conservatory Band and Brave Old World in Boston (Symphony Hall), Miami (Arsht Center) and West Palm Beach (Kravis Center). On the orchestral front, Mr. Perlman performs season-opening gala concerts with the Toronto Symphony under Peter Oundjian and the Pittsburgh Symphony under Manfred Honeck, and makes conducting appearances with the Los Angeles Philharmonic and San Francisco Symphony. Throughout the season, he performs with his regular collaborator, pianist Rohan De Silva, in recitals that take them across North America, Asia and to Europe in their first appearances as a duo in London (Barbican Centre), Paris (Philharmonie de Paris) and Munich (Gasteig). Further to his engagements as violinist and conductor, Mr. Perlman is increasingly making more speaking appearances. Upcoming engagements include Elon University’s Fall Convocation in North Carolina and the Association for Financial Professionals’ 35th Annual Conference in Denver. Itzhak Perlman’s recordings have garnered 16 GRAMMY® Awards and regularly appear on the best-seller charts. In 2008, Mr. Perlman was honored with a Grammy Lifetime Achievement Award for excellence in the recording arts. This season in 2015, Mr. Perlman sees three record releases in celebration of his 70th birthday: A new Deutsche Grammophon album with pianist Emanuel Ax performing Fauré and Strauss Sonatas, a 25-disc box set of his complete Deutsche Grammophon and Decca discography, and a 77-disc box set of his complete EMI/Teldec discography titled Itzhak Perlman: The Complete Warner Recordings. In 2012, Sony released Eternal Echoes: Songs & Dances for the Soul, featuring a collaboration with acclaimed cantor Yitzchak Meir Helfgot in liturgical and traditional Jewish arrangements for chamber orchestra and klezmer musicians, and in 2010, Sony released a recording of Mendelssohn Piano Trios with cellist Yo-Yo Ma and pianist Emanuel Ax. Highlights of albums over the last two decades have included a Deutsche Grammophon album with Mr. Perlman conducting the Israel Philharmonic, a live recording with pianist Martha Argerich performing Beethoven and Franck Sonatas (EMI); Cinema Serenade featuring popular hits from movies with John Williams conducting (Sony); A la Carte, a recording of short violin pieces with orchestra (EMI) and In the Fiddler’s House, a celebration of klezmer music (EMI) that formed the basis of the PBS television special. In 2004, EMI released The Perlman Edition, a limited-edition 15-CD box set featuring many of his finest EMI recordings as well as newly compiled material, and RCA Red Seal released a CD titled Perlman Rediscovered, which includes material recorded in 1965 by a young Itzhak Perlman. Other recordings reveal Mr. Perlman’s devotion to education, including Concertos from my Childhood with the Juilliard Orchestra under Lawrence Foster (EMI) and Marita and her Heart’s Desire, composed and conducted by Bruce Adolphe (Telarc). A major presence in the performing arts on television, Itzhak Perlman has been honored with four Emmy Awards, most recently for the PBS documentary Fiddling for the Future, a film about Mr. Perlman’s work as a teacher and conductor for the Perlman Music Program. In 2004, PBS aired a special entitled Perlman in Shanghai that chronicled a historic and unforgettable visit of the Perlman Music Program to China, featuring interaction between American and Chinese students and culminating in a concert at the Shanghai Grand Theater and a performance with one thousand young violinists, led by Mr. Perlman and broadcast throughout China. His third Emmy Award recognized his dedication to klezmer music, as profiled in the 1995 PBS television special In the Fiddler’s House, which was filmed in Poland and featured him performing with four of the world’s finest klezmer bands. Mr. Perlman has entertained and enlightened millions of TV viewers of all ages on popular shows as diverse as The Late Show with David Letterman, Sesame Street, The Frugal Gourmet, The Tonight Show and various Grammy Awards telecasts. His PBS appearances have included A Musical Toast and Mozart by the Masters, as well as numerous Live From Lincoln Center broadcasts such as The Juilliard School: Celebrating 100 Years. In 2008, he joined renowned chef Jacques Pépin on Artist’s Table to discuss the relationship between the culinary and musical arts, and lent his voice as the narrator of Visions of Israel for PBS’s acclaimed Visions series. Mr. Perlman hosted the 1994 U.S. broadcast of the Three Tenors, Encore! live from Dodger Stadium in Los Angeles. During the 78th Annual Academy Awards in 2006, he performed a live medley from the five film scores nominated in the category of Best Original Score for a worldwide audience in the hundreds of millions. One of Mr. Perlman’s proudest achievements is his collaboration with film composer John Williams in Steven Spielberg’s Academy Award-winning film Schindler’s List, in which he performed the violin solos. He can also be heard as the violin soloist on the soundtrack of Zhang Yimou’s film Hero (music by Tan Dun) and Rob Marshall’s Memoirs of a Geisha (music by John Williams). Mr. Perlman has a long association with the Israel Philharmonic and has participated in many groundbreaking tours with this orchestra from his homeland. In 1987, he joined the IPO for history-making concerts in Warsaw and Budapest, representing the first performances by this orchestra and soloist in Eastern bloc countries. He again made history as he joined the orchestra for its first visit to the Soviet Union in 1990, and was cheered by audiences in Moscow and Leningrad who thronged to hear his recital and orchestral performances. This visit was captured on a PBS documentary entitled Perlman in Russia, which won an Emmy. In 1994, Mr. Perlman joined the Israel Philharmonic for their first visits to China and India. Over the past two decades, Mr. Perlman has become more actively involved in music education, using this opportunity to encourage gifted young string players. Alongside his wife Toby, his close involvement in the Perlman Music Program has been a particularly rewarding experience, and he has taught full-time at the Program each summer since its founding in 1993. Mr. Perlman currently holds the Dorothy Richard Starling Foundation Chair at the Juilliard School. Numerous publications and institutions have paid tribute to Itzhak Perlman for the unique place he occupies in the artistic and humanitarian fabric of our times. Harvard, Yale, Brandeis, Roosevelt, Yeshiva and Hebrew universities are among the institutions that have awarded him honorary degrees. He was awarded an honorary doctorate and a centennial medal on the occasion of Juilliard’s 100th commencement ceremony in 2005. President Reagan honored Mr. Perlman with a Medal of Liberty in 1986, President Clinton awarded Mr. Perlman the National Medal of Arts in 2000, and in November 2015, President Obama bestowed Mr. Perlman with the Presidential Medal of Freedom, the Nation’s highest civilian honor. Itzhak Perlman’s presence on stage, on camera and in personal appearances of all kinds speaks eloquently on behalf of the disabled, and his devotion to their cause is an integral part of his life.